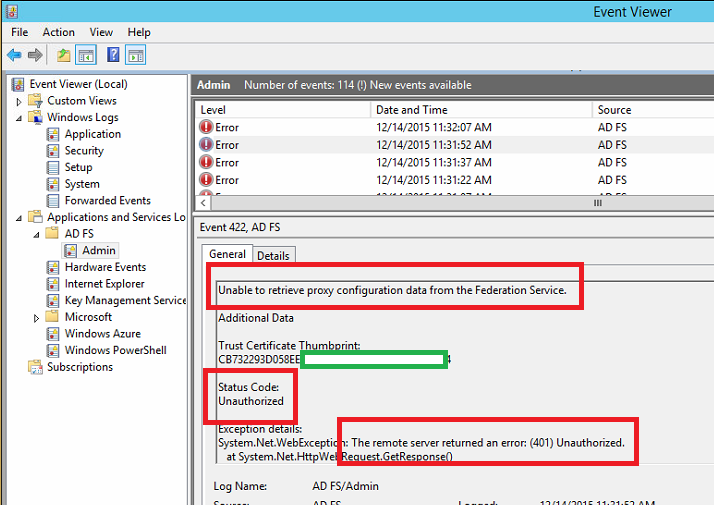 Ryan Betts, Cloud Solutions Architect: ADFS & WAP "Unable to retrieve proxy configuration data from the Federation Service. Status Code Unauthorized (401)". 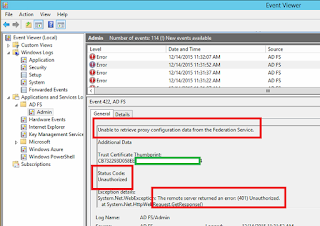 ADFS & WAP "Unable to retrieve proxy configuration data from the Federation Service. Status Code Unauthorized (401)". A very common problem when installing WAP servers for ADFS is the error "Unable to retrieve proxy configuration data from the Federation Service. Status Code Unauthorized (401)". Check the bindings for your ADFS servers http.sys file (only for ADFS 3.0, older versions use IIS). The following command can be used to display the http.sys bindings. The fix for me was to add the static binding of 0.0.0.0:443, I have highlighted it below. Without this I was receiving the "Unable to retrieve proxy configuration data from the Federation Service. Status Code Unauthorized (401)" error. To add this static 0.0.0.0:443 binding use the netsh utility, it fails if you do not enter it in stages like it is listed below. The certhash and appid used for this binding should be the same that is used in your ADFS service name binding that is displayed when you use the netsh http show sslcert command. You will then be prompted to enter administrator credentials on the ADFS servers. The GUI is misleading at this stage as it states you should use "local administrator credentials", I can confirm this is not the case as you will get an error unless they are domain credentials. 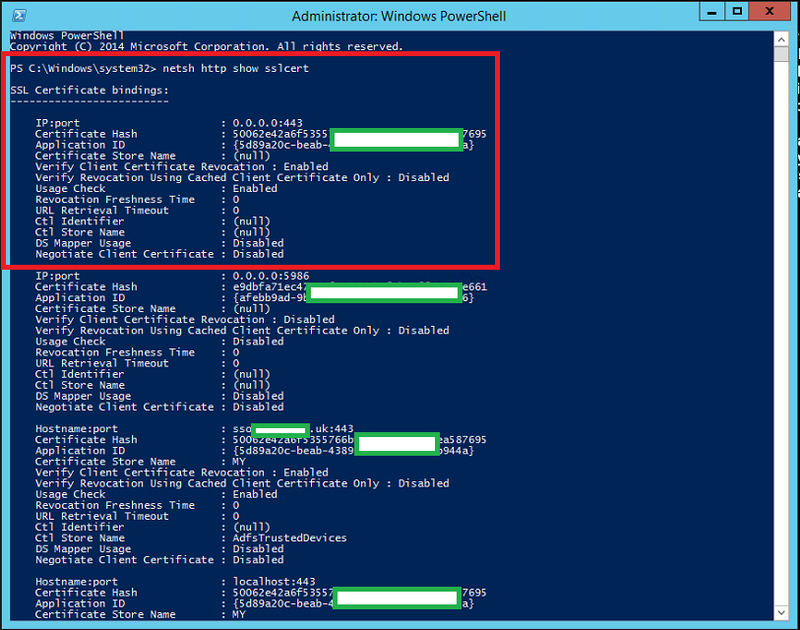 When you run the WAP configuration wizard it is worth knowing that you sometimes have to run the command 2/3 times before it works correctly (without changing anything). This first time I run the command after making the binding change return the error. "The federation server proxy could not renew its trust with the Federation Service. Ensure that the federation server proxy is trusted by the Federation Service. If the trust does not exist or has been revoked, establish a trust between the proxy and the Federation Service using the Federation Service Proxy Configuration Wizard by logging on to the proxy computer." 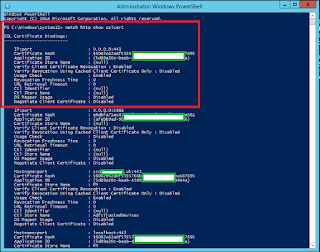 The message returned from the PowerShell window was "an error occurred validating the SSL certificate". The length of the certificate hash is invalid. Did you forget to add the preceding '0'." Without changing anything I then rerun the command and it worked correctly.